This photograph has been scaled down; full resolution photograph is available here (7,253 by 5,614 pixels). P-51 is armed with four 20mm cannons, the chin-mounted .50 caliber machine guns of the Mustang 1, were deleted. 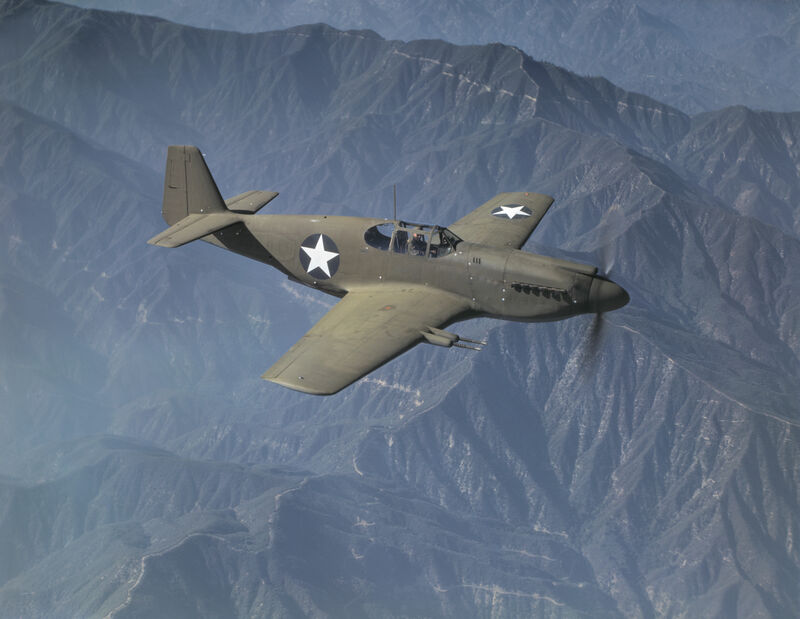 The last Allison-powered Mustang was the P-51A It was powered by the Allison V-1710-81 engine, and was very much like the A-36 but without the dive-bombing equipment or the chin-mounted machine-guns. It did carry the under-wing racks for bombs and external fuel tanks. A total of 310 were built, fifty were sent to the RAF as Mustang II's and thirty five were fitted with cameras and designated F-6B's. This is a P-51(no suffix), or Mustang 1a as the Brits called it. The P-51A is the one that followed, and is the one that was very much like the A-36 structurally and all that good stuff. North American P-51A armed with /4 x 20mm cannons w/125 rounds per gun. Photo is a publicity shot note that aircraft s/n has been deleted.